Photo 1. 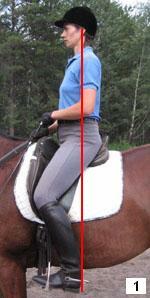 Good posture either on the ground or on the horse starts with a good alignment. A vertical line dropped down from the ear goes through the shoulder, hip and heel. The shoulders are relaxed and down, the pelvis is in a neutral (vertical) position, and the legs are under us. When the body is in good alignment, we need a minimum effort to stay or sit upright. Because we have to keep our balance on the moving horse (which is a task in itself), we do not want to do any extra work. Photo 2. Pelvis should be in a neutral (vertical) position. If you look at the bottom part of the pelvis, there is a flattened area between the front (pubic bone) and back (seatbones) parts. It has a boat-like shape. When we are in a saddle and the saddle fits us well, we sit on this flattened part of the pelvis. A well-fitted saddle is very important. Look how the bottom of the pelvic bone rises slightly in front, very much like our saddles do. Photo 3. A chair seat is a very common mistake. It starts with the pelvis rotated backwards. As a result, the rider sits mostly on the back part of the pelvis, on the seatbones. If you like to round your lower back and rotate your pelvis backwards when you sit in a chair, you are likely to have that problem in the saddle. Photo 4. A fork seat is another common mistake. It starts with the pelvis rotated forward. The rider sits mostly on the front of the pelvis (pubic bone). If you like to rotate your pelvis forward and arch your lower back when you sit (this is especially common in women) you may sit that way on a horse. Both of these situations create instability, discomfort and extra muscle work to keep you upright and in the saddle. Maintaining the neutral position of a pelvic bone is not as easy as it sounds. Click here for exercises which will teach you to recognize the neutral position. To stabilize the pelvis in the neutral position on the ground or on a moving horse you will need core (abdominal) strength. To keep our own balance we have to have a base of support under our center of gravity. Imagine you are sitting on the edge of a hard chair ready to stand up at any moment. Where would your feet be, in front of you or under you? Likewise, to be balanced on the horse you need to have your feet under you. You may argue that the saddle is your base of support and you do not need your legs under you. The saddle is moving and is not a very good base of support. If you stick your legs too much forward you will be completely at the mercy of your horse's movement, like a dead weight. If you put them too much back you will simply topple forward and sit on your crotch (which is uncomfortable by itself), and again at the mercy of your horse's movement. Having the legs under you is also neccessary to efficiently use thigh muscles during riding. I explain this on the Thighs page. Be careful not to push into the stirrups, it will inevitably bring your lower leg forward and you into a chair seat. Do not actively lower your heels because you will lock your ankle joints and push the legs forward even if you are trying not to.